I need scarves like I need a hole in my head! LOL A friend at church made scarves like crazy for me and for my mother. 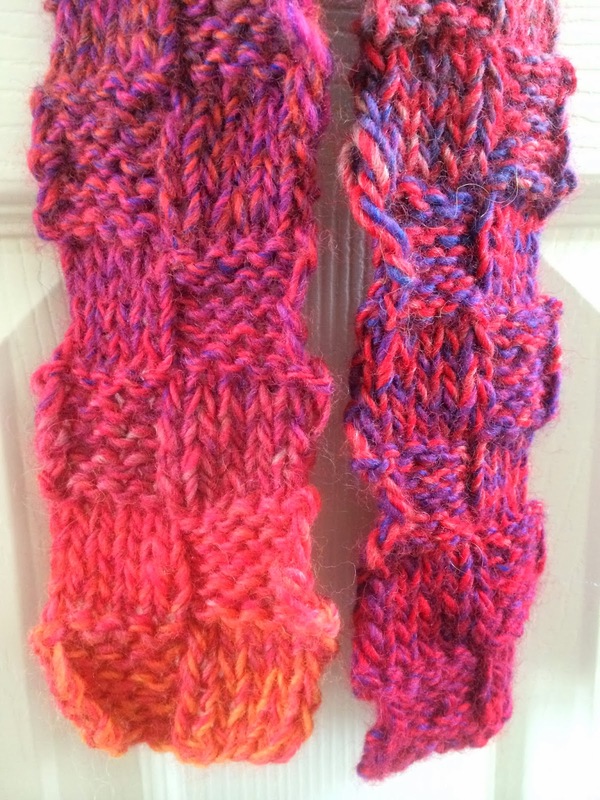 My daughter started knitting and gave me some wonderful scarves. When Mom went to be with the Lord I got all of her scarves, thus, I don't need any more scarves! But in the creative world does the word "need" even exist? I doubt it! If it did would we buy more yarn, more needles, more paints, more paper, more fabric, more stamps? Would we buy another journal before the last is filled up? You see my point - "need" has nothing to do with it. Joy is the right word! 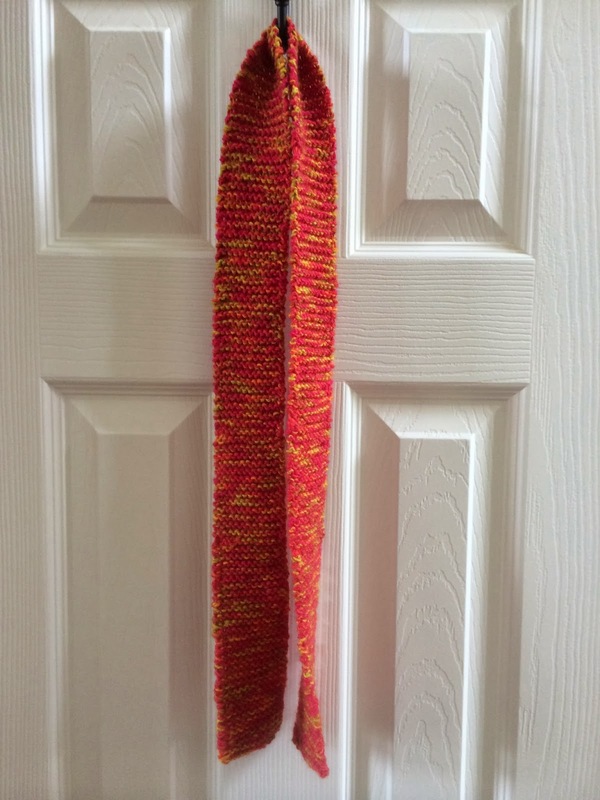 If I'm going to learn to knit then scarves must be made! I made bowls but one can't live on bowls alone! 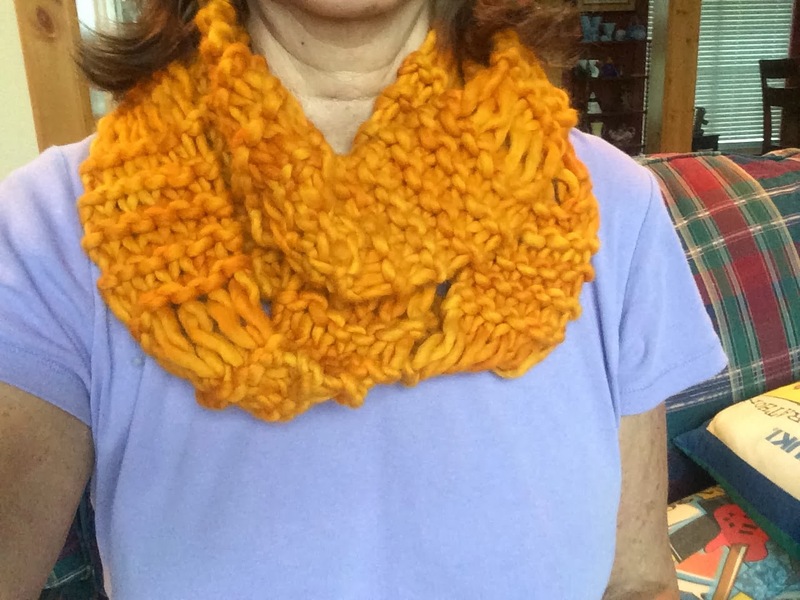 I made my cowl (see finished cowl below). 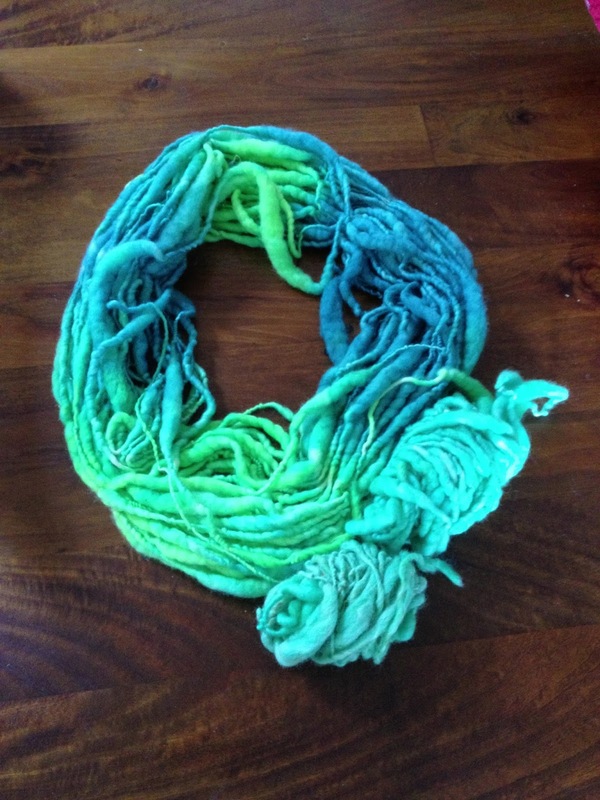 This will always be my baby as I spun it, dyed it and knitted it. No the fiber isn't from my boys - knew you were going to ask! My first scarf was this one in a rasta yarn. It's so soft and bulky and I was able to use large needles, but finished it was just too wide! I connected the two ends and made it into a long cowl, but just wasn't happy. 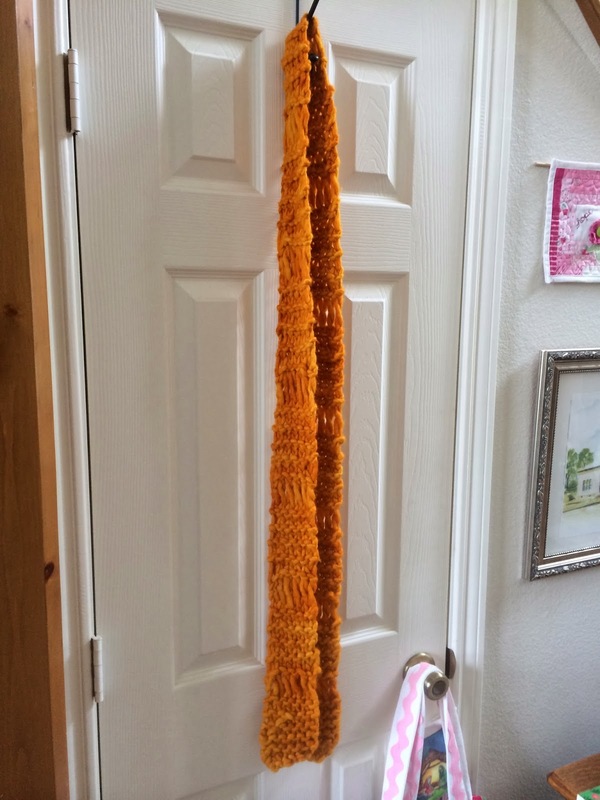 So I took it apart and redid it as a narrow long scarf. I have a long black coat and I believe it will be beautiful hanging way, way down! See the pretty handle hanging on the door knob - that is my new knitting bag my friend Deb made me . I will be showing it off in a blog all it's own! Stay tuned! 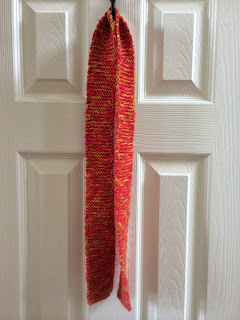 Then I learned to make a design when I made this skinny little scarf. I like it, but probably won't make another. It still needs to be blocked - someday! 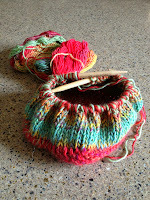 I used the variegated yarn that I used for the bowls. I love the surprise of the colors! At knitting group one Sunday a woman came in with a little skinning scarf and I just loved it, So I bought some sock yarn - doubled it and so far, I have this scarf done and one almost done and I will still have yarn left! I took a class with Diana North on wet felting an art batt and making a scarf. It's beautiful, but I'm still going to needle felt some more embellishments and add some beading. 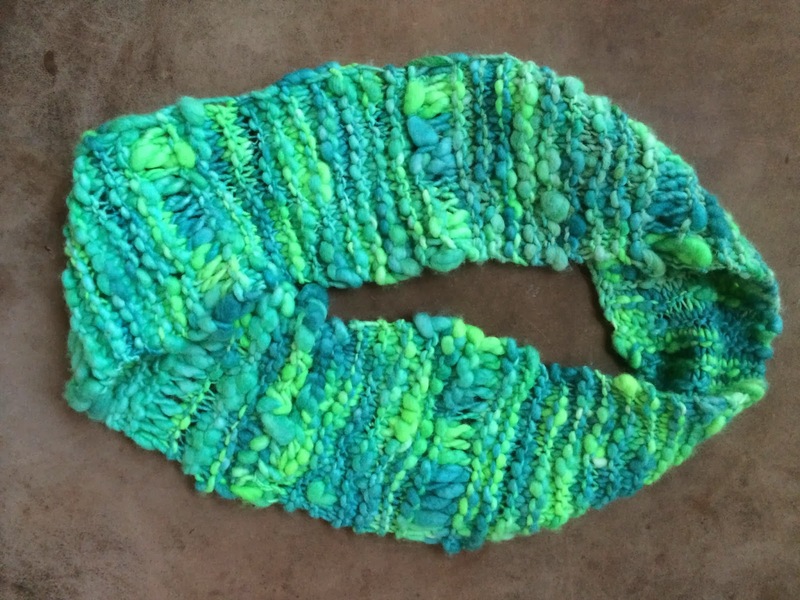 Last week I took another class on making knitted jewelry and it included the unbidden boa. I made this one in class. 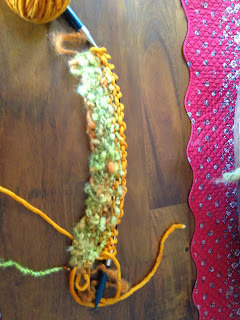 Love the yarn, with sequins and beads spun right into the yarn. I love how we knitted in bobbles and that I had the perfect beads to add to the ends when I got home! I made another one last Sunday afternoon. I had yarn I bought months ago from Diana and it was perfect for this boa. I love it because it can be done in a couple of hours! 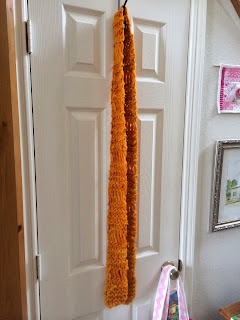 No time to get bored before it's done and no two scarves will ever look alike because they're made with art yarn. The yarn will greatly influence the look of the finished product. And the Bowls Keep on Coming! 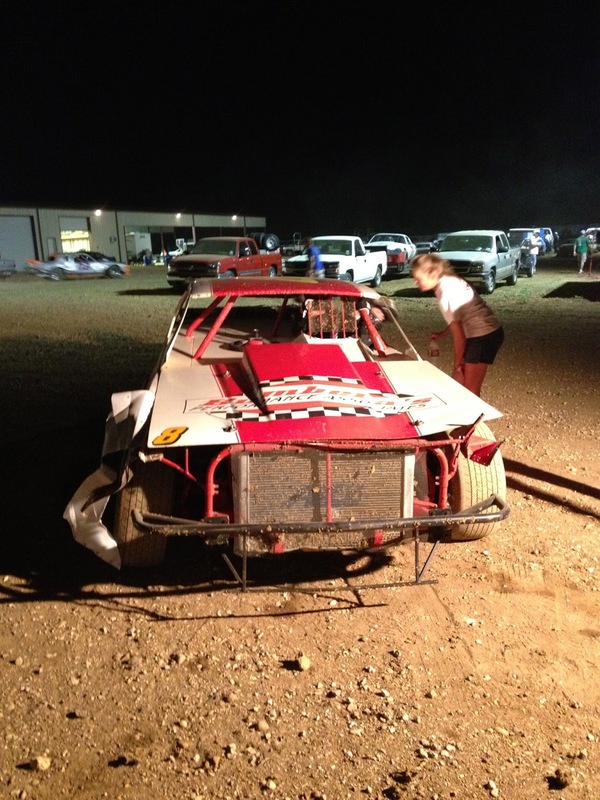 Have you ever had so much fun doing something that everything else just fell by the wayside? Well, knitting has done that for me! I just want to knit. I now have so much understanding about my mother and my daughter, both of which were and are avid knitters. I reduced the yarn down to one ball and pulled from the inside and outside, reduced the number of stitches and rows to half the number of the full size bowl and off I went. I've now made four of them and I might add they all felted to a different size. This neutral colored bowl is the first one I did and I loved the size and shape. I knitted three more in various colors and felted them all at the same time. I placed each one in a pillowcase, placed them in the washer with hot water, soap and some towels and agitated them for exactly the same amount of time and once they were rinsed and spun dry - I had these three bowls! Go figure three very different sizes and all of them different than the first one. It's a mystery! 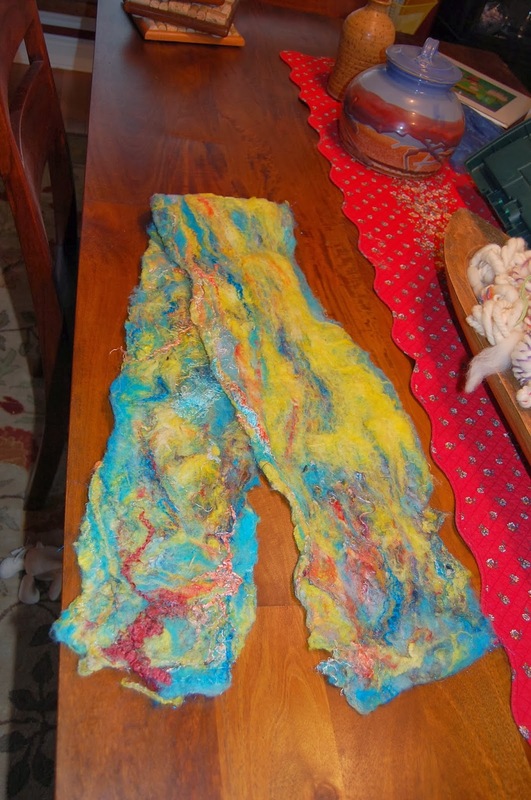 It could be that all of the wools were a little different, but I used the same brand of yarn, same size balls, knitted the same and felted the same! All of them are cute as buttons! 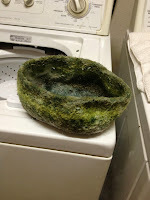 I don't think these particular "bowls" even needed to be set, although I did use some cans, as they seemed to be complete when they came out of the washer. I had them standing straight as in this picture, but rolled the top down and think it makes then look completely different and very cute. They can be used either way. This is such a simple pattern and so much fun. I love that I will always be surprised by the end product. 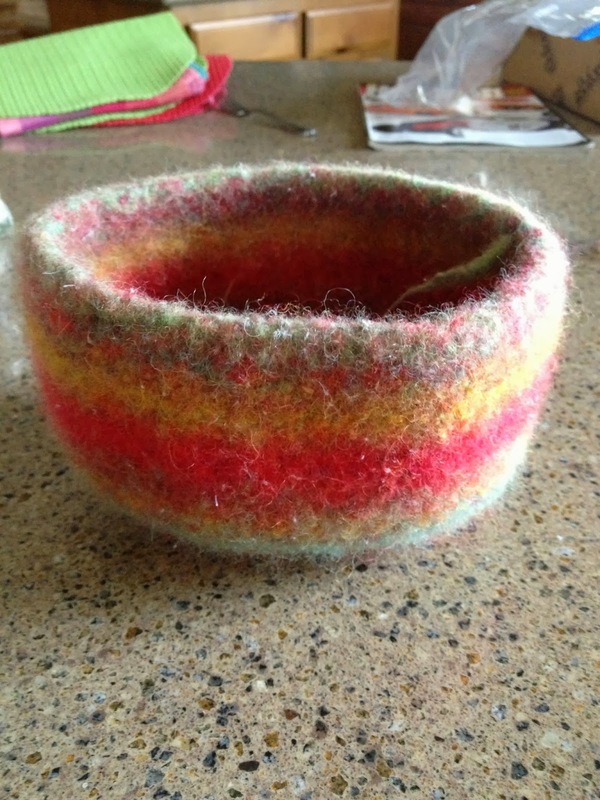 I have become obsessed with knitting and wet felting bowls. Since I started my knitting lessons a few weeks ago, I soon started knitting bowl shapes that are then washed and felted them. They're knitted in the round and I quickly learned to love circular needles, too. 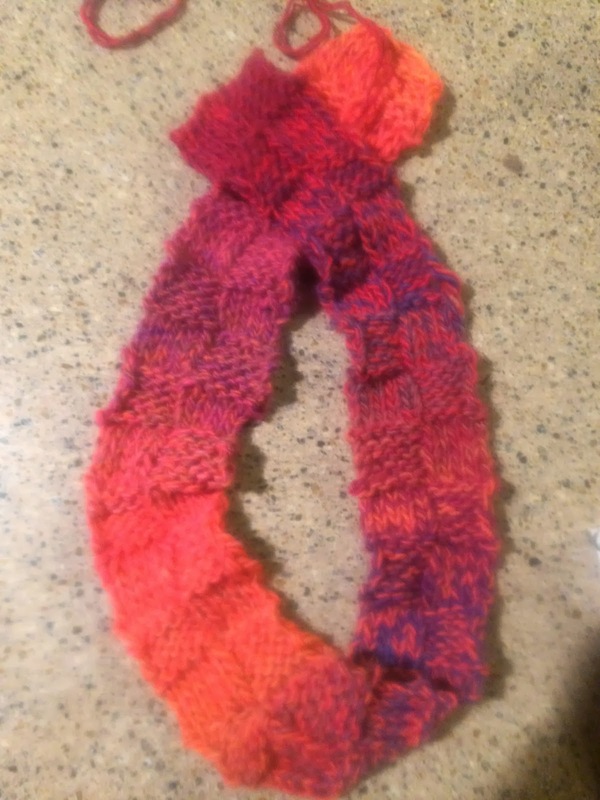 The first one I made was with a multicolor yarn. 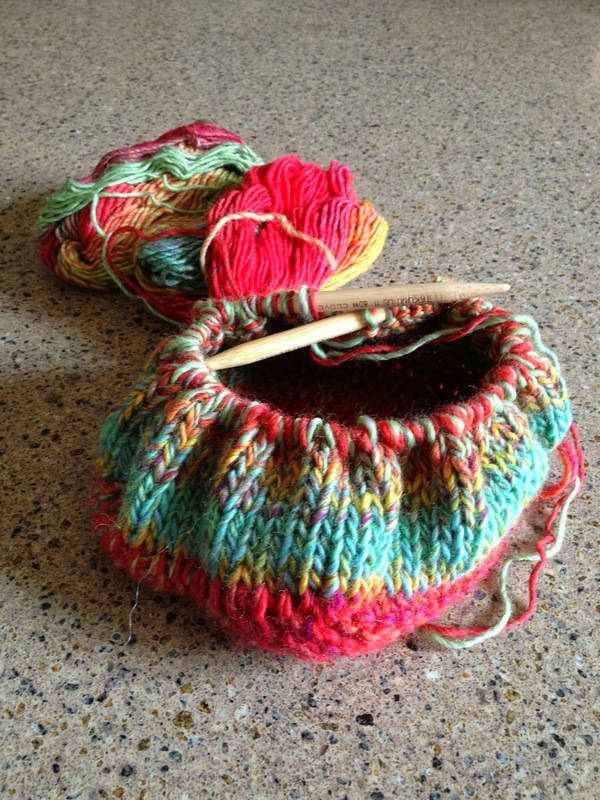 You use two balls for each bowl using two strands knitted together in a very easy pattern on circular needles. 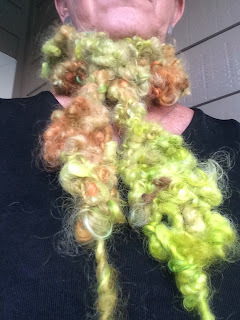 The next yarn I chose was a dark green with some chartreuse in it and since those are some of my favorite colors it was an easy choice. Both bowls came out to be exactly the same size and shape and my Fiesta chili bowl fit right inside to help set the shape. I think it might be able to be used with the bowl as an insulator, keeping the contents warm. 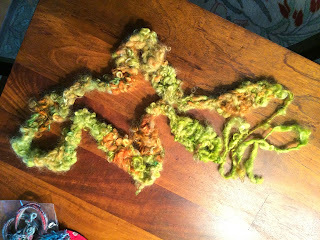 Below you can see one of them knitted waiting for it's bath and then felted and almost ready to shape! 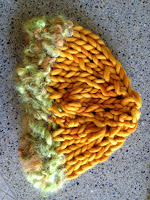 Knitted - ready for felting! Checking the progress - ready to rinse and spin! So here they are without the bowls inside! Great for keys beside the front door? Don't know their use, but do know they will go to someone I love! Too cute to keep - can't wait to see who choose what color! So much fun, there will soon be more! My first and only hat! Yet!!!!! I do have plans for another, but this one was fun for a firsty and I got to use my art yarn spun by Diana North. 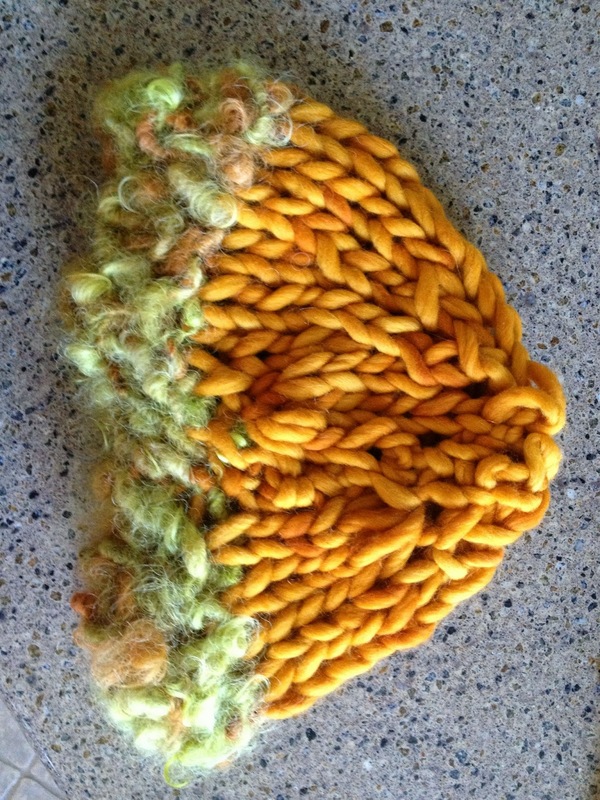 Diana taught my first art yarn course and her yarns are soooo yummy. I checked this yarn out for weeks and then grabbed it before someone else beat me to it. I still have some left and will add it to something somewhere down the line. 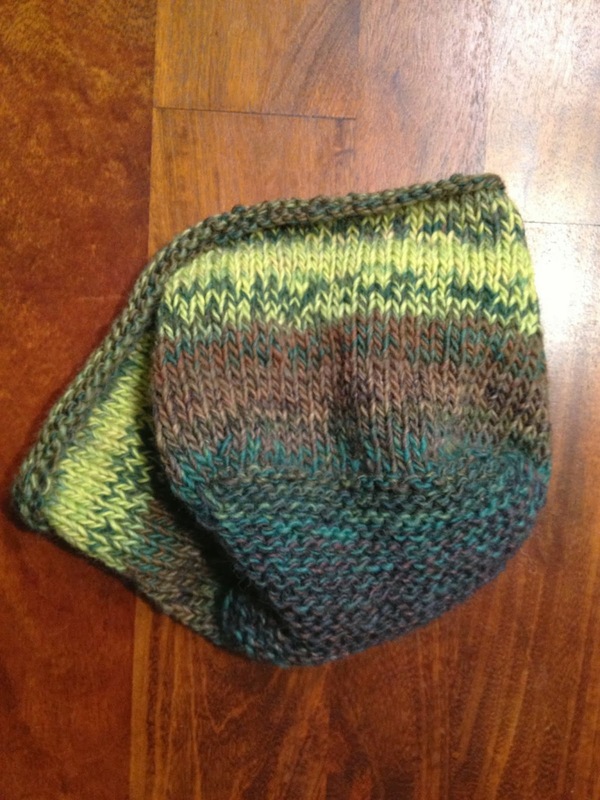 I used the yummy yarn for the trim and then another great bulky yarn for the rest of the hat. The pattern says the "1 hour hat"! That did not prove to be true for me, but maybe when I've a little more experience I will make one in that "warp" speed! Started knitting on some really large straight needles, but switched over to size 15 circulars - a much better fit! When my sweet husband saw this hat on me, he sweetly suggested that it might be a great hat for our 10 year old granddaughter! Yes, I believe he is right and so off it will go to Austin as the weather turns cooler! And so the last of the hat pictures is to the left! Looking forward to a hat class at WC Mercantile, so that the next one is a little more suited for me! I don't need to tell anyone that I've spent this year learning new things. We got the boys and have had to learn so much to keep them healthy and safe and build a trust relationship with them. I decided I wanted to process their fleece myself and so I got a drum carder and started learning how to card fiber. Next was my spinning wheel and class and as you've all seen lots of unbalanced yarn! 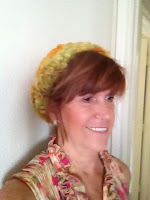 I then decided I should learn to dye it and knit it - all of which I've now done, but none of them well! The advantage of felting your knitted piece is that it hides all flaws!!! I've had lots of fun and I know my pieces are the end result of my practice, however, I need lots more practice and I really need to concentrate on the basics of spinning and knitting and it came to a crux today when I read the following quote from Picasso in a magazine today. It was an aha moment of why I need to learn the basics! so you can break them like an Artist! This is why I needed to take a basic sewing course and why although I quilted some little pieces they weren't as good as they could be - why, because I didn't spend enough time learning the basics before I got bored and quit! Same with my art - yes I love painting, but I've not learned the basics and so often my pieces are lacking something - a depth, a dimension that is just simply missing. I'm breaking a rule that I don't even know! And now we come to fiber - carding, spinning, dyeing and knitting! I need the basics in all of these and I need practice, so I can eventually move into real art yarn and art batts and express myself within the yarns - but I really can't break the rules until I know them! Well, I've proven you can , but not with the result I desire. Most of you who know me, also know, that I like to start at A and run as fast as I can to Z! I would prefer to skip over all of the steps in between. This creates a "Jill" of all trades, but a master of none! I'm hoping that keeping this in front of me as I continue on this fiber journey will help me focus on the rules, so I really can break them later! Not even hinting that I will become a master, but I will be better than if I just keep plunging in and jumping ahead without learning step 1, 2 and 3 . . . 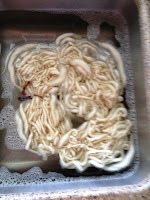 So off to the carder to process some of the boys fiber and on to the wheel to practice spinning yarn - we will see if I can really slow down and enjoy the journey to a balanced yarn! Little did I know when I went to my favorite little wool store for my first knitting class that I would be totally addicted in four weeks! My mom tried to get me to try it for years and I just wasn't interested. 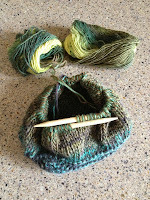 The only reason I wanted to try it now was to knit some of my own yarn! I just thought it would be fun to take my boys fiber, card it, spin it, dye it and then knit it. Little did I know that I would want to knit all of the time and I wouldn't care what kind of yarn! What??? My wool is turquoise? My teacher and owner of WC Mercantile, Stephanie, gave me a project Friday when I left the store to card fiber and spin over the weekend! 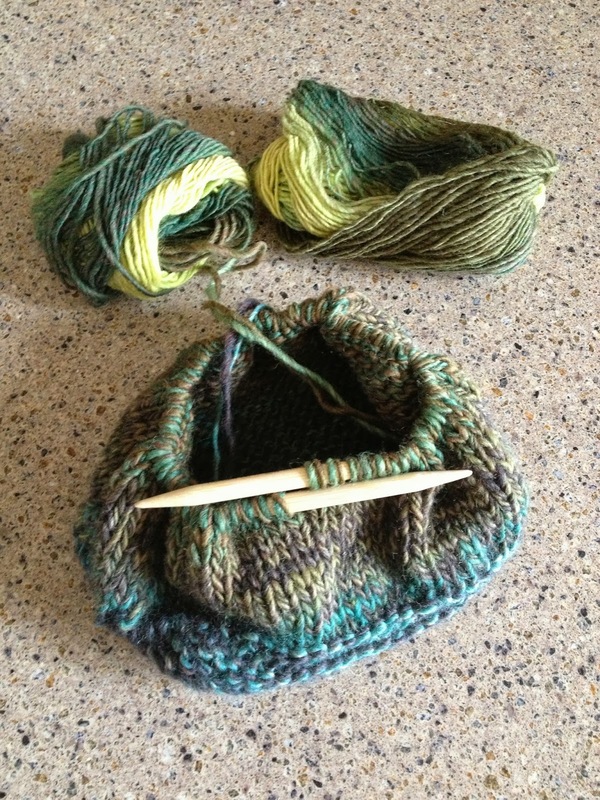 I have not been at the wheel, but I did complete the cowl I began on Friday and have begun a different size bowl. I wanted to see what they would be like half the size of the first ones I made. I think little bowls would be great to have on a kitchen counter or dresser to drop my rings in before dishes or bed and so that is under way. Just realized the bowls have been on FB but I haven't thought to blog about them. They are really my first project, but with purchased wool. 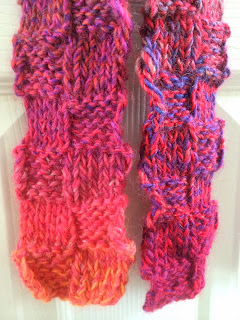 They are fun to make and have been my instruction to knitting in the round and circular needles! I will do a post soon. I took the 68 yds. 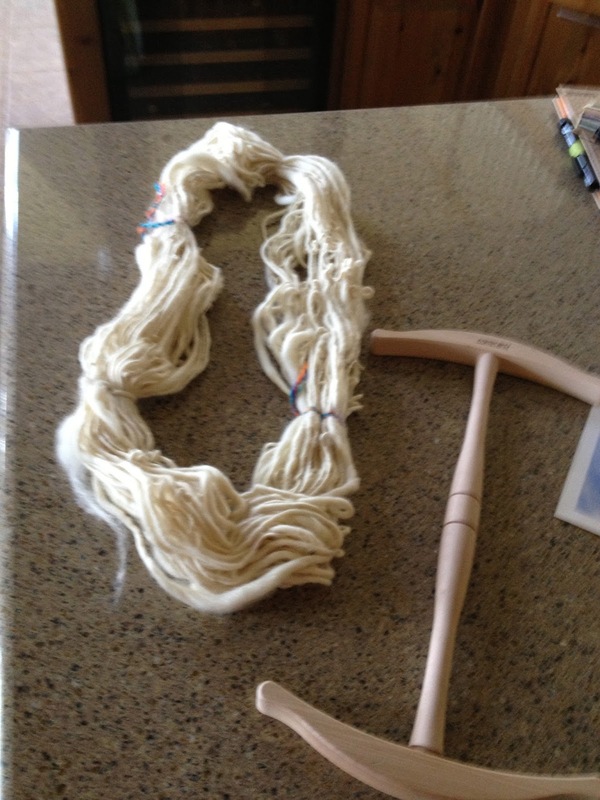 I had spun to Navasoto with me this week and Steph helped me dye it and I dyed two smaller pieces as practice earlier in the week. That's why I took my longer piece to get help with the dyeing - my practice pieces were pretty one dimensional and I didn't want that for my longer yarn. I loved how it turned out and Steph said I could add the two smaller balls in to use it all together. 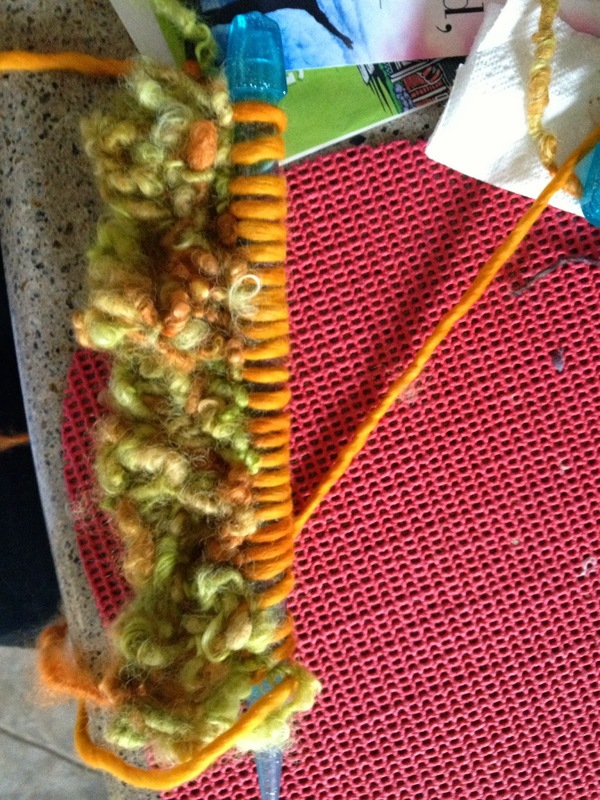 That made me happy because one of the smaller pieces was spun from Lefty's fiber! The rest was wool, but I was so excited to have fiber from one of my boys in my first piece. 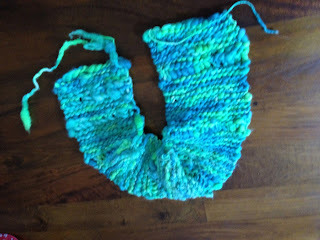 Friday I started knitting my art yarn (that's yarn with personality) and finished the cowl on Saturday. It was a good thing I had the two extra balls of yarn as it was barely long enough, but I like it and now I can wait a couple of months before it's cold enough to wear it! Yarn was thick and thin and a hoot to knit! I have to admit that if my mom saw my knitting and my yarn she wouldn't be real impressed! I'm afraid she would put it with the girls I used to paint and my red hair as things she just didn't really understand! I do have to learn some spinning fundamentals as Bill wants a scarf from the boys fiber and the project Stephanie gave me is to card fiber from the boys, spin it and get ready to knit! My yarn will have to be a little more consistent to make a good scarf for Bill, so I will be doing a lot of practicing. 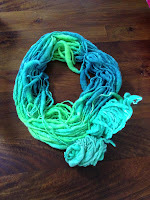 I love art yarn and this would sort of qualify - mine is thick and thin by accident and true art yarn would be spun with purpose, but it is fun. I wish you could see the tiny little coils that are complete opposites from the huge pieces with almost no twist at all. I seem to go from too much twist to no twist, but I love spinning, so with time my yarn will get better (I hope) and created with purpose. We have exciting workshops coming in March with Jacey Boggs (Ply Magazine). She has written books and done DVD's on art yarn and I'm beyond excited to take a two day class with her and then have her in attendance at our Spin In! 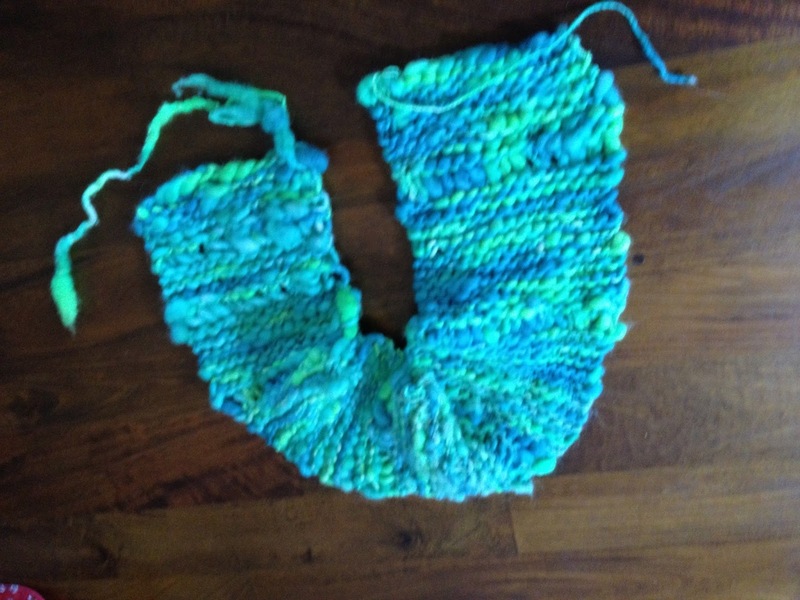 So this is my first project from roving to yarn to cowl! I still have to join it together and then I'll be able to use it in about two months or so. I love it with all of it's booboos (hard to see with funky yarn) and all. My first but sure not going to be my last! 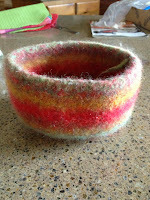 Be back in a day or so with the felted bowls! This has been a fun weekend. Wednesday night I found out I would have surprise company coming on Friday so I didn't go to knitting on Friday morning in Navasoto and I definitely needed some help with what I had done so far this week, so I signed up for a needle felting class on Saturday and spent another wonderful day in Navasoto at my favorite wool store WC Mercantile and ended the evening watching Boyd Bumbera race his tail off (actually the front bumper) at Cotton Bowl Speedway. It was a great race, with great friends. But back to the class, it was fun, I learned a lot, made this wonderful bird and some great new friends! 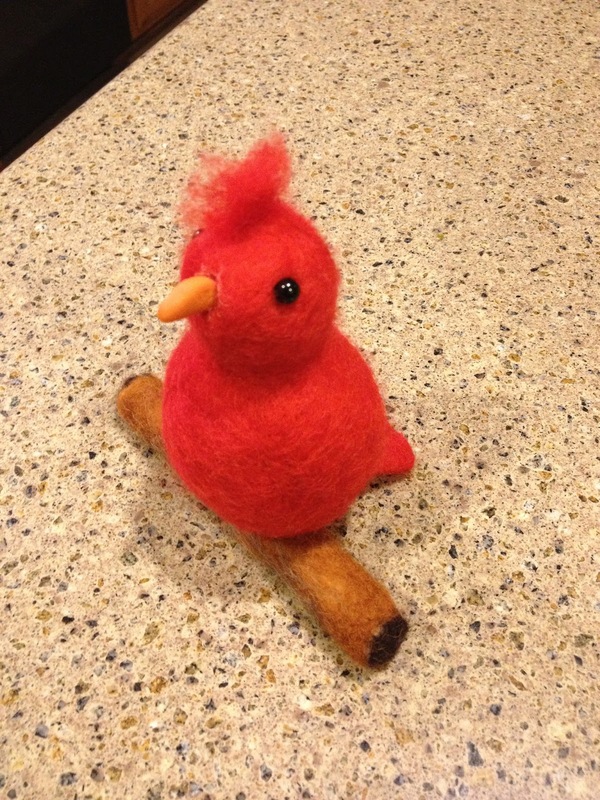 Yes, he's completely felted except his beak which is Sculpy. I have done needle felting for years, but mostly flat pieces that I use for other things, such as a journal cover or pin cushion, remember the dress and bird I did last winter, anyway, I hadn't ever tried to make things! Don't know how much I will use this new found craft, but I think there may be a few snowmen in the near future. 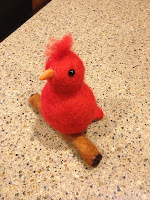 We will see and I learned some things to help with all of my needle felting including using the Embellisher. While I was there I got a niddy noddy (a tool for taking yarn off the bobbin) and examined some of my knitting from the week. Stephanie was able to help me see what mistakes I was making and taught me how to bind off, so I now have this 3 x 6 strip! Whoopee! My first two pieces with all of the mistakes have been taken off the needles and rolled back into little balls, but I learned a lot from both of them. Stephanie showed me how to take my yarn off my bobbin and so I did that today. I got approximately 68 yards of yarn and the bobbin wasn't nearly full. 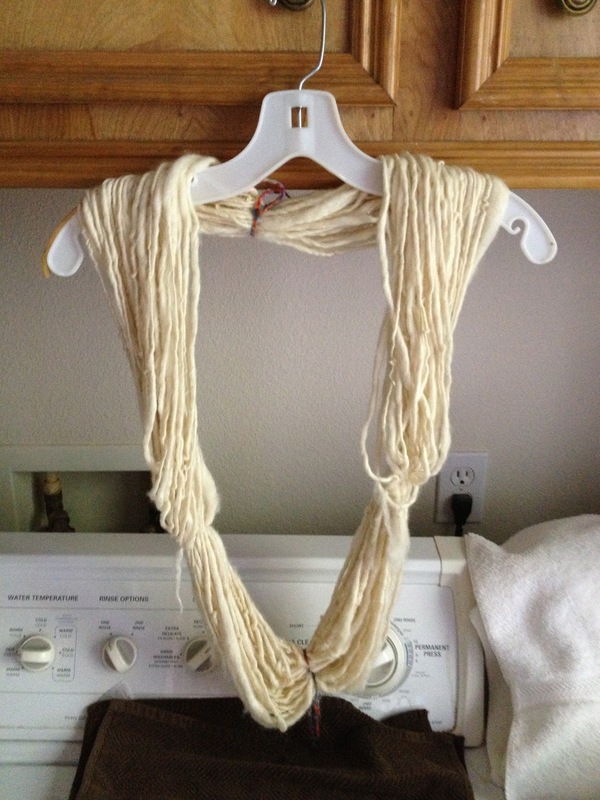 I have set the twist (soaked the skein in hot soapy water and gave it a cold rinse) and hung it up to dry. It's a funny yarn (but that's what I want) and so I will take it with me Friday to see how she recommends I knit it. I had a tiny ball of yarn I had spun from some roving I had and so I knitted it today. Not easy it was so many different sizes, but got about three rows and was able to bind it off, so I was pleased. It is totally useless, but it was good training for future knitting. This is probably one of the most interesting things about my spinning and knitting - the practice part! I've always wanted instant gratification, thus watercolor and acrylics vs. oils! But with this it's just fun to do it - no matter the result. A whole new experience for me. As I've often heard the best should be saved for last, and so I must tell about my Friday company. My "fake" granddaughter (fake part is a long story saved for another time) from Austin came in with her parents and stayed with Bill and I while they went to a dinner in Katy. Kaleigh is 10 and she is a blast. 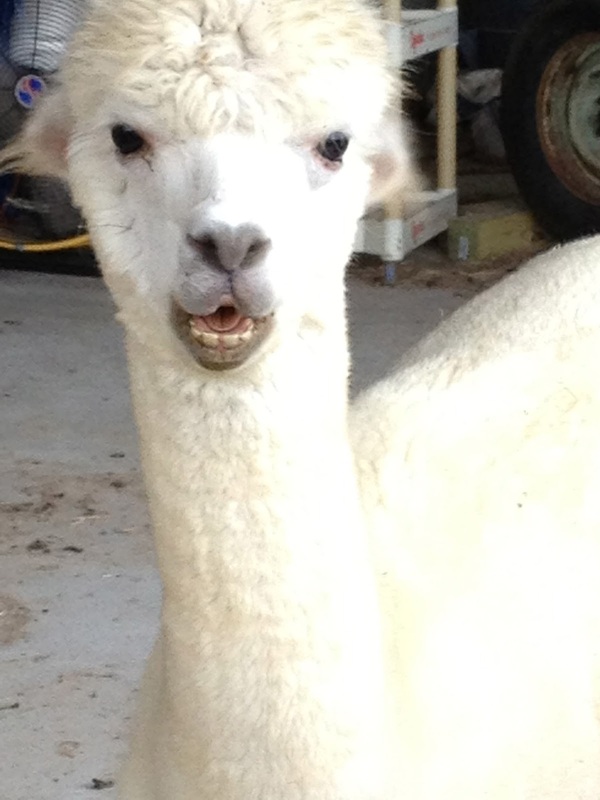 We hosed and fed the alpacas, went out to dinner and had a DQ and then headed to the studio. 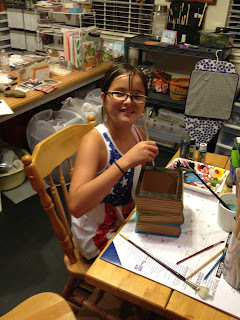 She wanted to craft! So she looked through my stash and found a tissue holder shaped like a stack of books and she painted it. It was so much fun to watch her pick out the colors and the brushes and just have fun. We have lots of other things planned for her next visit - fun, fun, fun. So this week will be filled with spinning, knitting and felting, with no particular result in mind. 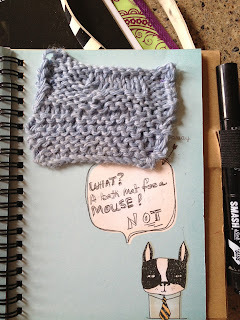 Well, except felting as I am going to try and get some pin cushions made and possibly some felted wool dryer balls. I have made three small ones, but have more in the works Sounds like a fun filled week.. I don't even know where to start this has been such a whirlwind five weeks! Of course, my last post was about my studio floor and organization, in the middle of the five weeks. Well, that's still in the works. The floor is done, but I'm carefully returning it to a workspace, sorting and parting with some unnecessary things. I'm putting shelves up high, but haven't gotten them painted yet - that darn yard work doesn't do its self, so I had to spend a few days on that and ...... I had a knitting class on Friday! So this is really where my story starts today! 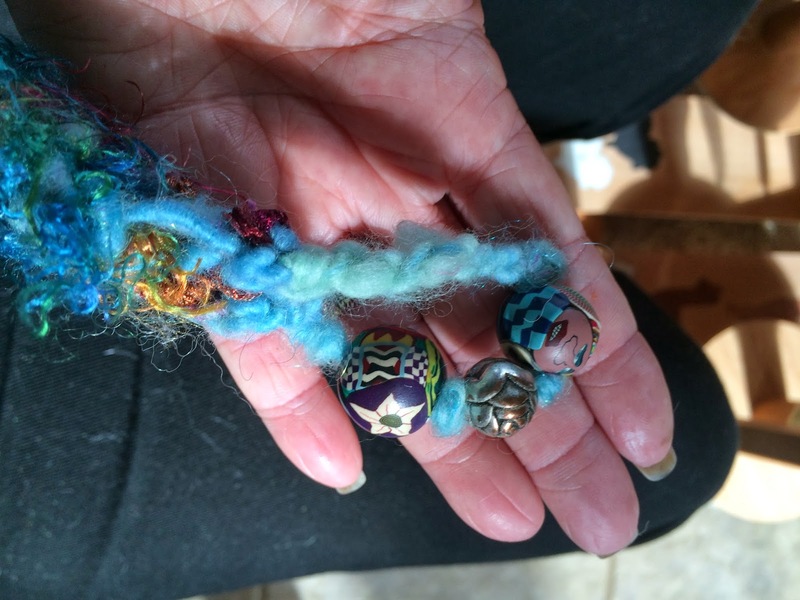 In just five short weeks I have taken my second class on spinning with a drop spindle, taken a spinning wheel class and bought a wheel, taken a class on spinning art yarn and a fiber prep class - those all were on consecutive Saturdays. And last Friday I went to my favorite little wool store (WC Mercantile) and took a knitting class! Whew! I am crazy!!!! My first post of the year talked about my word for the year. I chose bloom and said in my January 28 blog that maybe it should have been challenge. Now I'm wondering if it wasn't learning or maybe it should have been practice or patience! All of these words fit this crazy year. Or maybe crazy should have been my word! If anyone would have told me five years ago that we would live on three acres, have alpacas and that I would be spinning and knitting I would have told them they were crazy! But here I am and it's all happened or is happening! The craziest part is the knitting. My mom knitted and my daughter knits, but I always said I would hate it. Mom tried through the years to teach me, but it was to no avail. She tried to teach me to crochet, to no avail. But as I began to spin (also said I wasn't interested in doing a wheel) and I saw my yarn, I began to think that I would like to make something with it, if I could learn how to do it, but I didn't think I could and I really didn't think I would enjoy it! So I went to my class last Friday to see if there was knitting in my DNA and much to my surprise there is! Not only could I do it, it felt good. 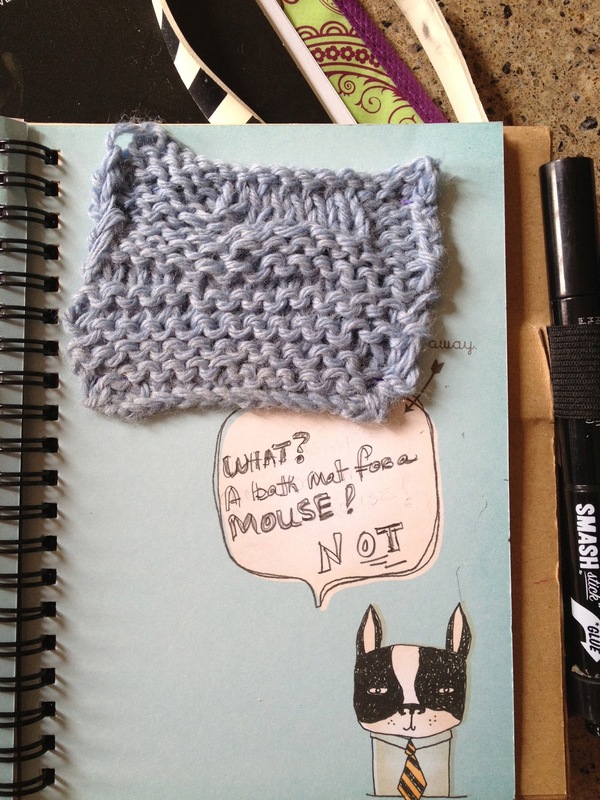 I only completed a bath mat for a mouse, but I am hooked. Full of holes and mistakes! I have practiced every spare moment this weekend and it's all I can do to leave it alone! 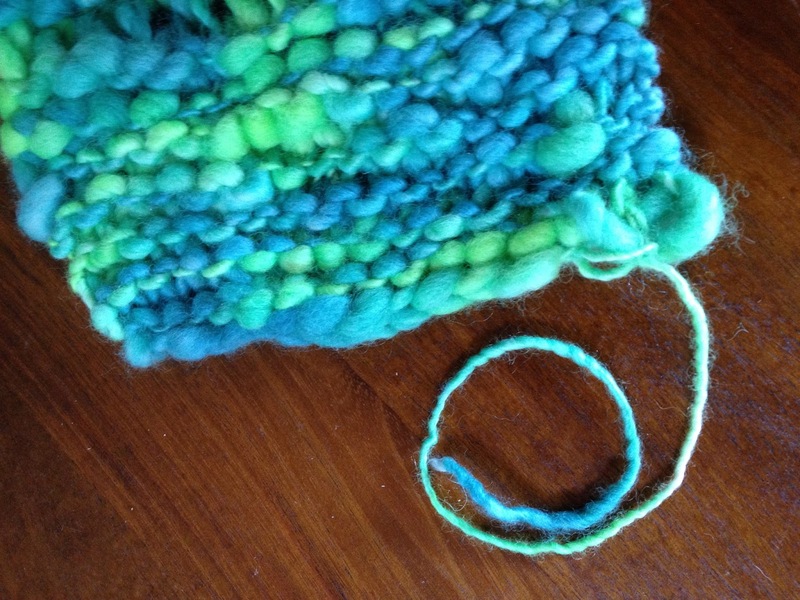 I've practiced spinning and I do love it, but oh that darn knitting bug! I won't have to eat my words with my mom, but my daughter, well that's another thing! I probably won't ever be as good as she is, she is amazing, but I will have to admit that I now understand why she enjoys it soooo much. Right now I'm spinning "interesting yarn" and knitting straight rows with no plan in mind, but who knows what I might do some day as I grown in my knowledge of art yarn and knitting! BTW - don't let two pictures fool you, I've casted on and started over many many many times between these two pictures! But at least I see improvement which encourages me to keep on keeping on! Another try at it and a little improvement! Yes, this year my word should have learning. Learning about alpacas, fiber, carding, spinning, knitting and most of all, learning about me! I am full of surprises - even to myself! Just reread the post and saw how many times I used the word crazy - so I think this is a two word year - crazy and learning! It fits - at this age learning this much in one summer is crazy.